Our CPR/AED certification follow the latest American Heart Association and ECC/ILCOR guidelines and are nationally accepted. The course is designed for first-time participants as well as people who are renewing their CPR/AED certification. You always have an option to take the exam once you have reviewed the course. This course teaches latest CPR/AED techniques to address the most common situations that can happen in workplace or community setting. This course is designed to train you to respond to emergencies. You will also learn essential life-saving techniques to feel confident in situations where immediate action can make all the difference. The course is developed by U.S. board certified physicians. The study guide for the course allows you to systematically review everything you will need to know for the certification exam. Laws and Safety regarding CPR: This section explains the symptoms of sudden cardiac arrest, Good Samaritan laws and the chain of survival along with universal safety precautions that should be taken during any emergency. First Aid Situations and Management: This section discusses emergencies like bleeding control, burns, poisonings, muscle injuries, broken bones, strokes seizures, heat related illness, frostbite and hypothermia. It further more explains the management and steps necessary to bring these injuries and illnesses under control. Certification 24 Hours a Day, 7 Days a Week, 365 Days a Year! Earn First Aid certification when YOU want to earn it. 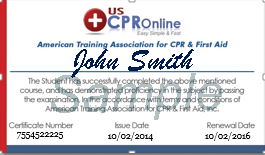 Upon passing the First Aid exam, you may download a PDF version of your certification as instant proof. Print this PDF card for use until your official provider card arrives by mail.